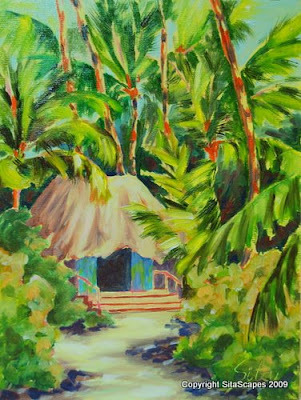 Artist's Comments: Tucked in the shadows, grass thatching catches a pocket of light creating a pleasant glow thru the dense foliage. A winding pathway dancing with shadows attracted my attention as my eye was drawn to the dark dense doorway. I was quite amazed at how quickly and freely I was able to pull together this painting. Perhaps it was because I had worked on such larger pieces that this small painting felt like a sketch of sorts. I didn’t labor over details and just freely brushed on the paint working from thinner dark coats to thicker, lighter highlights.